> of bandwidth, but are highly irregular. Are those workloads commonly capacity constrained? I.e. would it make sense to limit the maximum data sets if large gains can be made in latency and bandwidth? 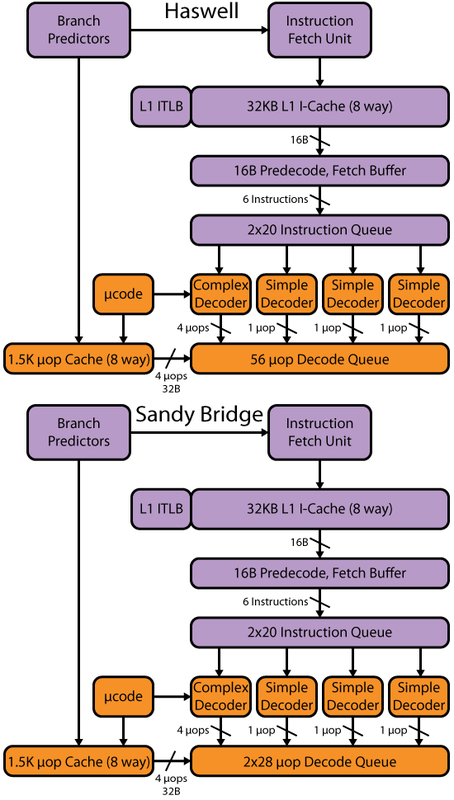 I'm guessing that with the solution I proposed (with dual memory hierarchies) it would be possible (though not necessary or advantegous for streaming workloads) to cache the stacked memory just like the standard memory (that resides in DIMMs on the motherboard). That way latency could be low and bandwidth very high. Eric (eric.kjellen.delete@this.gmail.com) on August 9, 2012 5:21 pm wrote: > David Kanter (dkanter.delete@this.realworldtech.com) on August 8, 2012 10:49 am wrote: > > > As far as I can tell, there are really only two types of > > > > > workloads: > > > > > > 1. Latency-sensitive applications with irregular data > > access > > > patterns. > > > 2. Bandwidth-sensitive applications with highly > > regular data access > > > patterns. > > > > > > Any program that includes both > > types of code could use both > > > latency-optimized memory addresses (i.e. CPU > > caches and external DIMMs) and > > > bandwidth-optimized memory addresses > > (stacked memory) with the virtual memory > > > space partitioned into different > > address ranges referring to the respective > > > physical memory > > types/hierarchies. Am I missing something big or is it really > > > this > > simple? > > > > Most sparse matrix methods would be hybrids. They really need a lot > > of bandwidth, but are highly irregular. > > > > David > > Are those workloads commonly capacity constrained? I.e. would it make sense to limit the maximum > data sets if large gains can be made in latency and bandwidth? I'm guessing that with the solution > I proposed (with dual memory hierarchies) it would be possible (though not necessary or advantegous > for streaming workloads) to cache the stacked memory just like the standard memory (that resides > in DIMMs on the motherboard). That way latency could be low and bandwidth very high.